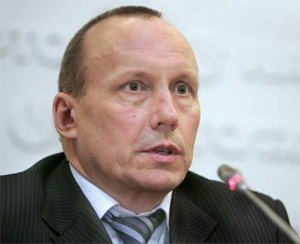 Eugene Bakulin, Chairman of the National Joint Stock Company "Naftogaz of Ukraine"
Particular attention should be given, firstly, to the search of natural resources in Ukraine - both on land and in the Black Sea shelf. Secondly, we need to reconstruct the transmission system to improve its reliability, and to lower its power consumption. This will make Ukraine a reliable and competitive so that we will meet all the requirements of the European Union and the prospects for further cooperation between Russia and EU countries. We see this as our main development prospect. What are the key areas of cooperation with Russia? Gas transit to European Union countries, participation in the development of natural resource extraction on the territory of Ukraine and possibly in Russia and other countries. There are difficulties for a while. We would like to further cooperate with Russia in oil production and transit of energy. Today it is not a secret that there are new areas for transit of gas, including bypassing Ukraine. We understand that there are objective reasons for such alternatives. But we have to show to Russia and Europe that Ukraine is a reliable partner and generally cost-effective. Today we build our politics basing on it. This task is just for both: a president and government of Ukraine - to show the world that Ukraine can guarantee the security of energy resources for the European Union. Whom are you negotiating for supply of liquefied natural gas with? We are negotiating on several fronts - it is both Azerbaijan and Turkmenistan, and Russia. We develop our policy ensuring energy security and conditions of mutually beneficial interests of neighboring countries, with whom we can provide cooperation. I 'm not ready to state volumes of transportation of oil and gas because we still produce calculations. This calculation affects the interests of Belarus and Russia, and we must provide both economic and political guarantees. At the exhibition "NaftaGAZ 2010" was presented a lot of technologies to automate processes. Is there some that you are ready to deploy? Yes, Ukraine and Naftogaz are engaged in exploration of gas production, transportation, refining of oil and gas condensate for both its customers and to ensure the transit of Russian gas to Europe. On all these issues we need to constantly carry out modernization, not to be inferior to all other countries. We must adopt new technologies - both domestically produced and imported. Does it become easier or harder to work with the advent of new president of Ukraine? Harder, but in a good sense of the word. requirements for all business executives are raised to lift efficiency indexes of the economy as a whole.